You can build your own walk in cooler for produce storage at just a fraction of the cost of commercial coolers. A CoolBot and a regular household window A/C unit lets you turn any well insulated room into a walk-in cooler. Instead of paying over $5000 for a small commercial walk in cooler, you can save thousands with this DIY cooler option. CoolBot walk in coolers are perfect for: hunters, farmers, cheese makers, homesteaders, brewers, preppers, dairies, taxidermy, or those who want additional food storage. 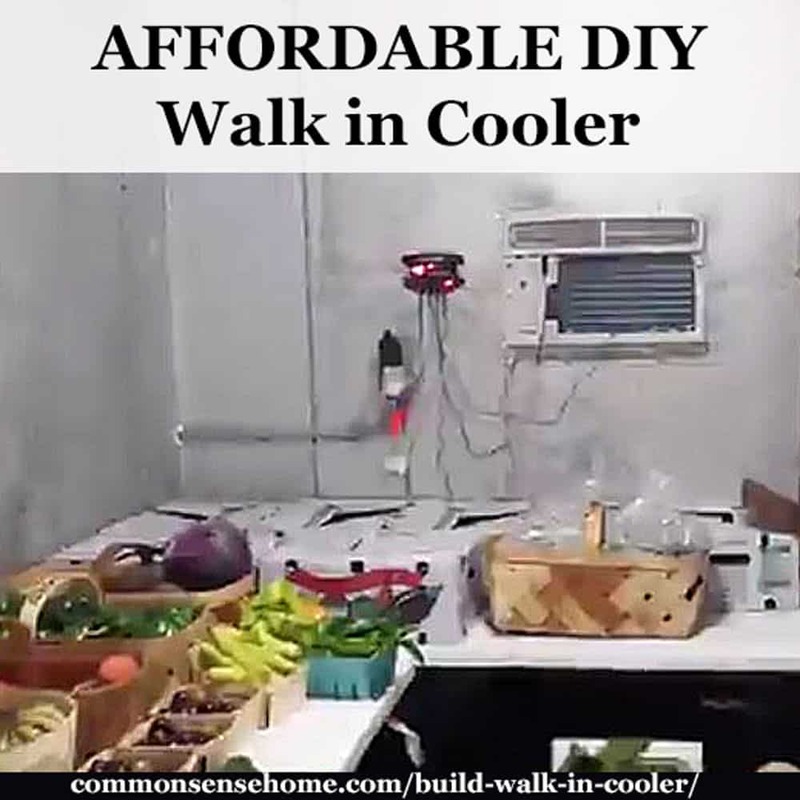 Why Build a Walk In Cooler? I run a produce delivery service and was struggling to hold my produce. We quickly ran out of space in our traditional refrigerators, and I had a hard time controlling the temperature. Some produce would freeze and some would spoil quickly due to temperature irregularities. 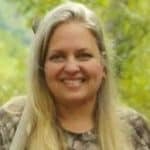 I was losing hundreds of dollars in inventory weekly. A friend of mine that is a farmer and owns a local nursery recommended a product called a CoolBot. 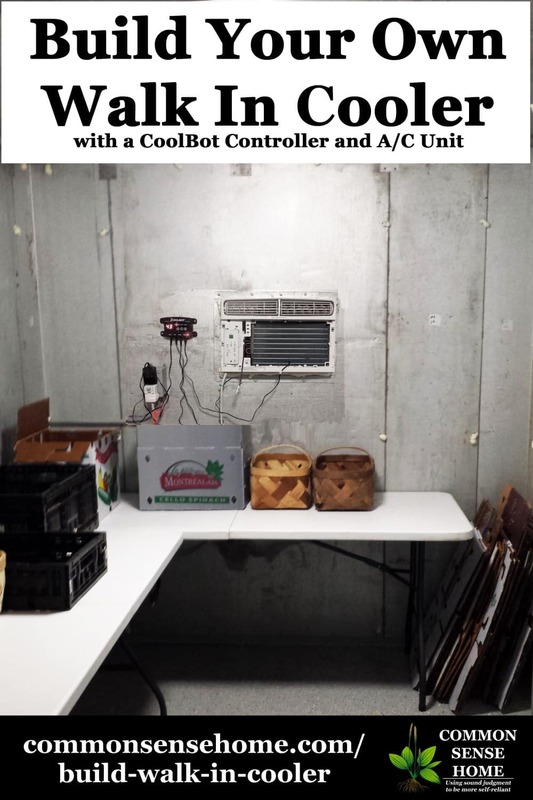 Her husband turned their storage shed into a walk-in cooler by adding a Coolbot to their window unit and double insulating the walls. After some research, we decided to add a cooler to a room in our garage. Which Insulation is Best for a Walk In Cooler? Fiberglass insulation proved to be the least initial expense. You would need to double it to create the recommended R-25 value (like my friend did). The down side is condensation buildup. You'll need to replace the insulation every five years or so, because it will get wet and mold over time. If you need a walk in cooler for 5 years or less, this would be the cheapest option. Blown and Foam insulation is easy to install and works well with existing rooms. Unfortunately, it doesn't provide the needed R-Value (25 or greater), and is susceptible to the same condensation and mold buildup as fiberglass insulation. Polystyrene is the best insulation to use for cooler applications. It’s what they use for commercial coolers. The down side it is hard to find and not cost effective to ship. After much research and pricing all the options, we decided to look into used walk-in coolers. Much to our surprise, we were easily able to find a local (within a 2 hour drive) contractor that removed equipment from restaurants and grocery stores and had used walk-in coolers for sale. We bought an 8×9 Walk-In Cooler that included all the side panels, ceiling, and enough extra panels to make a door, all for $300.00. 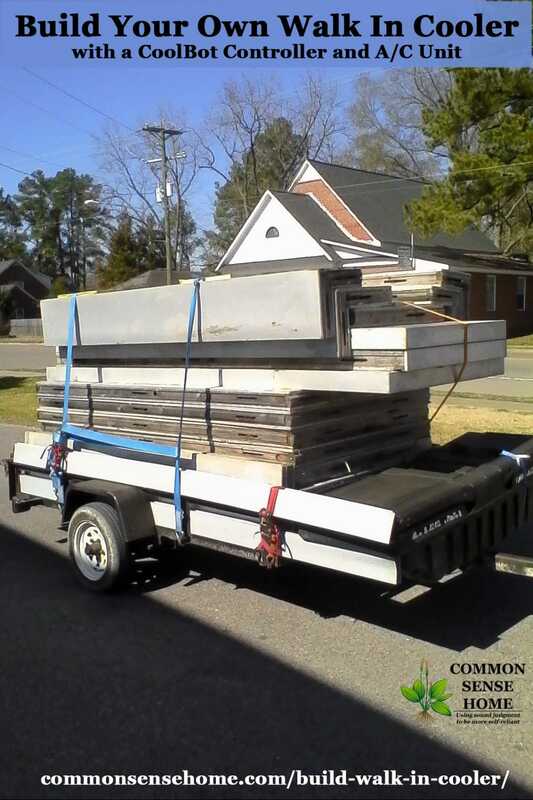 Because we did have to prefab a lot of the interlocking panels to fit our space, custom build and modify a door, and run electricity to the cooler, I would give this DIY project a 4 out of 5 for carpentry skill level. If you converted an existing shed or room with electricity into a cooler using insulation and sheathing, then moderate carpentry skills could easily accomplish this project. Which AC Unit Should I Use with a CoolBot? After building the rest of the walk in cooler, we added our window unit. The size of A/C you need will depend on the size of your room. You have to have an A/C Model with a digital display, because the Coolbot will not function properly without this feature. See “CoolBot AC Unit Size and Brand Recommendations” for more information. Once you have your room or cooler well insulated and your window A/C in place you can install your CoolBot to create your walk in cooler. Install any brand of window A/C unit which you’ve purchased separately. (See our A/C Selection Guide to make sure you have the right air conditioner for your space). Cut an appropriate-sized hole in the wall of your walk-in cooler, put the A/C unit into the hole, and then use some type of insulation, like foam sleeves for pipes, so that you can easily remove the A/C instead of having to carve it out in case you switch A/Cs in the future. Plug the CoolBot into a standard outlet – the CoolBot uses no more electricity than a cell-phone charger, so no special electrical connections are needed. The first (labeled “Room”) measures the temperature of the room. Let it hang free, but make sure it is not making contact with any metal and not in the direct pathway of the cold air coming from the A/C. The second wire (labeled “FIN Sensor”) is placed into the front cooling fins of the A/C unit. Gently place the sensor as low as possible, but ABOVE the first horizontal cooling tube. Use a pen or pencil to widen a space 1-2 inches up from the bottom and put the fin sensor 1/3 of an inch in so it is not touching the coolant pipes behind them. It should stay there on its own. No tape or screws. You may need to gently pinch the fins closed around the sensor, but be careful not to damage the sensor. The third wire (labeled “Heater”) attaches to the A/C’s temperature sensor. The temperature sensor actually comes out of the A/C; on a new A/C the temperature sensor will be mounted on small plastic brackets in front of the fins. Wrap the CoolBot “Heater” wire up with that air-conditioner temperature sensor using a small 1/2 inch by 1 inch piece of aluminum foil (included) to ensure a good thermal connection. Allow this foil pack to hang freely away from any metal and out of the direct pathway of cold air. The CoolBot comes pre-programmed to cool your room down to 42°F (5.6°C), however, you can set it to whatever temperature you want. Does the CoolBot Cooler Work? Almost one year after installation, and I can’t say enough about this product. 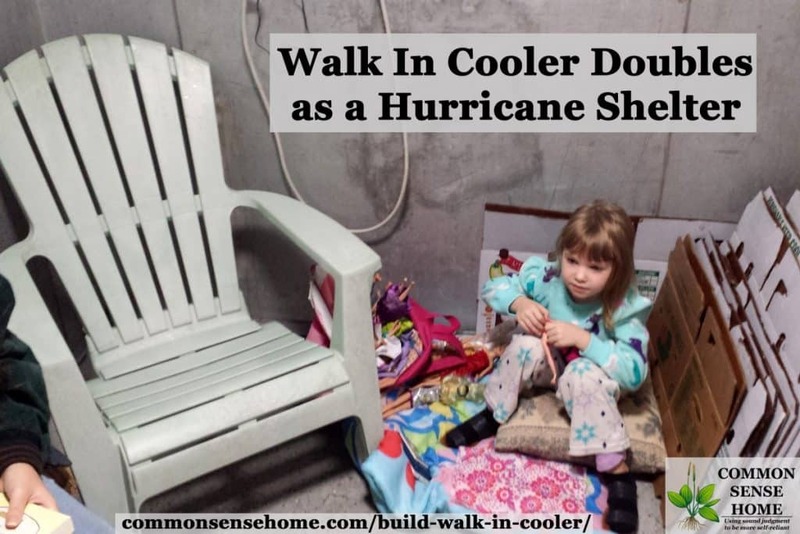 It allowed me to expand our CSA business, increased our food storage capabilities, and – as an unexpected bonus – our walk-in cooler doubled as a shelter during a hurricane. We recently went through Hurricane Matthew here on the coast of South Carolina and we were not able to evacuate in time. Our family took shelter in our cooler as the eye of the storm and heaviest winds passed over us. With the reinforced walls, concrete foundation and sound structure, it was the perfect safe haven for us to weather out the storm. How Much Does a CoolBot Walk In Cooler Cost? The CoolBot uses 40% less electricity than traditional coolers, which saves us hundreds of dollars per year. The cooler has also saved us thousands of dollars by preventing produce spoilage. In northern climates you may be able to keep food cool in a root cellar, but for southerners and those who need to maintain a set temperature range (like commercial kitchens), a walk in cooler is a must for large scale cool storage. If you have a bigger budget, Coolbot also offers complete walk in cooler kits on their website, ranging in price from around $4000 to $8000. They demonstrate set up of these units in the video below. The air conditioner installation instructions start at about 7:18, CoolBot installation at around 9:00. 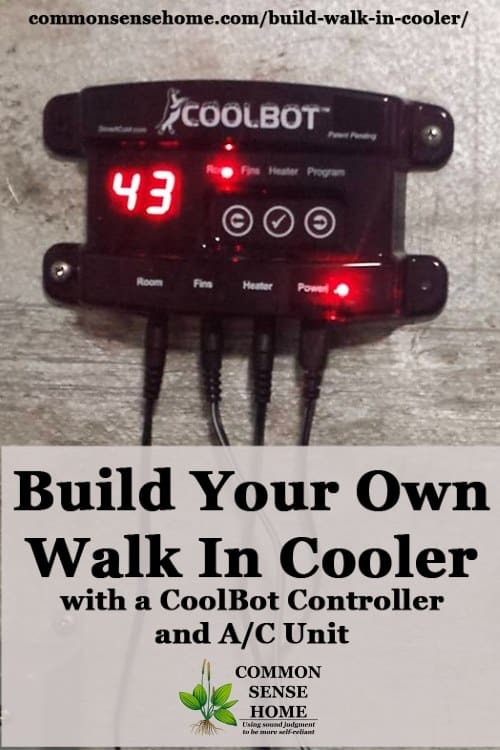 Have you tried using a CoolBot or walk in cooler? Share your experience in the comments below. Thinking about building a walk in cooler at some point in the future? Don't forget to Pin or bookmark this post – or share it and try to talk your friends into helping you build. I live in the Charlotte area and I am interested in building a similar unit. Would you please provide me with the restaurant liquidator you acquired your unit from. It was an individual contractor down by the Charleston area that did it on the side. I will see if I still have his number, it was a couple of years ago. You may also want to check Craigslist, I often see some listed on there as well. You should try Priceless Futures in Charlotte. They’re great people and have everything you can think of from buying out stores of various types. You’ll probably find a lot more things that you can use from shelving to deli slicers, various fixtures, furniture, etc, etc. Try to talk to Nabil… Tell him Mark sent you. I’ve just had an interesting experience using a Ink Bird ITC-2000 thermostat. $14.00. It occurred to me it could mimic what Coolbot does if you simply route the AC thermostat to a location that is always warm, electrically force the thermostat to on or wire the Ink Bird into the thermostat circuit. $14.00. It has a 10 amp relay and compressor protection (so that it doesn’t cycle on and off too quickly), alarm, target temp, difference temp, C or F setting, etc. Not bad for $14.00. Is it still working? Would like to hear about that? I have used the coolest setup now for several years…we have a small orchard and this has been the answer for extending our season by several months. One year I was having some trouble with it icing up the fins on the the air conditioner, got in touch with the guy who created the coolest, he was great to work with…had things figured out very quickly. Our setup would require the A/C (10.0000btu) to be in an inside wall. We can run a condensate drain, but I have no idea how much heat that A/C will end up throwing into the other room. Any thoughts/ideas? We used to have a more conventional cold room setup in my sister’s basement when we had a family catering business. The extra heat dumped into the basement was fine in winter, but come summer when we had the cooler running in combination with the stoves, the kitchen got unbearably hot. Where would you get glass doors,if you are building a cooler/ flower display? Do you put a light in the ceiling? I’d probably check with a window/door company, or company that makes refrigerated displays – whatever you can find in your area. I assume you’d want a light to be able to see inside. LED lighting would emit less heat.